It is at the heart of the Tregor region on the Northern coast of Brittany, at the far end of the "Wild Peninsula", facing the ocean amid a wild and authentic landscape, that Martine and Jean Donnay have chosen to install their distillery "Glann ar Mor" (literally "By the Seaside" in Breton language). The maritime environments is marked as much by roughness - when the prevailing winds are blowing - as by tenderness. A colony of seals has found its happiness, having settled on one of the many group of islets which can be seen in front of the distillery. The landscape is continuously modified by the movements of the tides, which in the area have an amplitude reaching twelve meters at the period of equinox. In this country of traditions, haunted by Breton and Celtic legends, this extreme peninsula of the "Cotes d'Armor" represents a surrounding which is out of the ordinary for the settling of a unique distillery, in the purest Celtic tradition. In spite of the beauty of the environment, this is yet not the reason for which Glann ar Mor is established here : it is a known fact that two thirds of the quality and of the character of a whisky depend directly on the conditions of its long period of maturation. Whisky lovers are well aware of the benefit of a maritime climate, marked by its salted and iodized air, which influences the character of the whisky through the exchanges intervening between the inside of the cask and the surrounding environment. With temperatures which are permanently very mild, the thermometer virtually never getting below zero degree Celsius in winter, and summers being warm yet temperate and exempt of lasting heat waves, the oceanic climate of the peninsula combined with the seaside location (see https://bit.ly/2GG8F88) allows the whisky to reach its maturity and its balance in a quite significantly faster manner than is the case in areas with dryer climates with lower temperatures. Yet, this faster maturation does not take place at the detriment of quality, quite the contrary in fact. The humidity resulting from the nearby sea is known to favour the maturation of spirits with a smooth character, it speeds up the elimination of the “fire” which it possesses when just flowing out of the still, thus delivering a whisky with a better balance and rounder on the palate. The combination of a mild and humid climate has nevertheless not only advantages : it results in a rate of alcohol evaporation (the "Angel Share") which is higher than the one observed with colder temperatures and in dryer warehouses. Our experience with maturation of “Celtique Connexion” whiskies in Sauternes casks (since 1997) has actually shown us that the Angels of the peninsula are particularly thirsty ! Yet, we should not complain : our Angels are no connoisseurs since the share they take away is precisely the one we want to eliminate. Indeed, the evaporation of the undesirable alcohols represents, together with the exchanges observed between the spirit and the oak of the casks, one of the two reasons for the long period of maturation to which the whisky is subjected after its distillation. 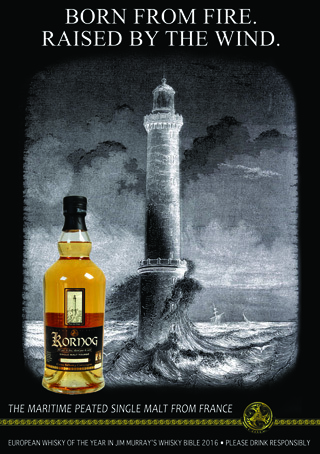 The distillery is producing several types of whiskies, in particular KORNOG which is a peated Single Malt and GLANN AR MOR which is a non peated Single Malt. Those whiskies have received many acknowledgements in competitions and in specialized magazines, KORNOG having in particular been elected "European Whisky of the Year" in Jim Murray's "Whisky Bible 2016". with the isle of Er, the deep sea lighthouse of "Heaux de Brehat" and the isle of Brehat.